The Japanese publication, Holiday Auto Magazine, intercepted a patent drawing of the next generation Mazda MX-5 Miata while it was on its way to the Tokyo Patent Office this week and gave the world a glimpse of what’s to come for this hotly anticipated sports car. 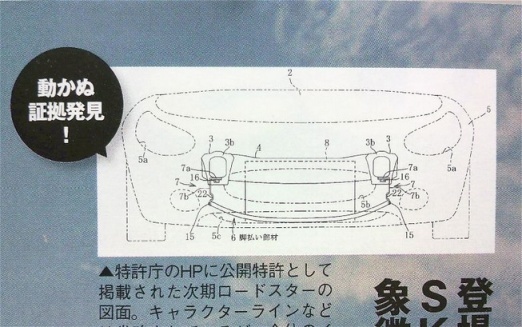 The intercepted drawing gives us a view of its front end which, based on the dashed outline, suggests that Mazda will be ditching the smiley face in a return to the more classic look of the ellipse grille and round fog light recesses seen in the MX-5’s predecessors. Fortunately, the pop-up headlights will remain a thing of the past and the new headlights will be getting some updated technology with LED lighting. The MX-5 has had three different generations throughout its 21 year history, numerous design updates and even more engine changes. The new MX-5 will reportedly remain a rear-wheel drive compact sports coupe. Sources say that engineers have been ordered to cut 720 lbs from the 2,480-pound curb weight of the current model with a goal of getting the Miata back to its original weight of 2,178 pounds. To achieve this goal, engineers are using high-strength steel for the body and are said to be planning to power the Mazda MX-5 with a 1.5-liter SkyActiv-G four-cylinder engine that will produce up to 160 horsepower and will be mated to a six-speed manual transmission with an option to change to a dual-clutch semi-automatic transmission. 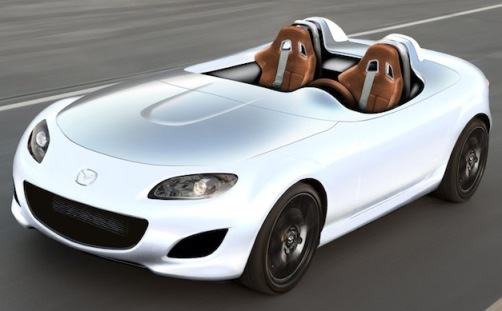 The new Mazda MX-5 will bow out as a concept car next year before the production model is slated to be unveiled at the 2013 Geneva Motor Show. In the mean time, we can expect more speculation and opinions on the future of the most famous sports car in the world to continue as additional details are provided.